Two years before the appearance of the report the 32-gun frigate, HMS Alarm, had had its hull completely covered with a thin copper sheathing. The purpose of the sheathing was twofold. Firstly it was intended to reduce the considerable damage caused by the teredo woodworm, and secondly the well-established toxic property of copper was expected to lessen the speed-killing barnacle growth which always occurred on ships' hulls. After a two-year deployment to the West Indies HMS Alarm was beached in order to examine the effects of the experiment. It was soon discovered that the sheathing had become detached from the hull in many places because the iron nails which had been used to fasten the copper to the timbers had been `much rotted'. Closer inspection revealed that some nails, which were less corroded, were insulated from the copper by brown paper which was trapped under the nail head. The copper had been delivered to the dockyard wrapped in the paper which was not removed before the sheets were nailed to the hull. The obvious conclusion therefore, and the one which was contained in that report of 1763, was that iron should not be allowed direct contact with copper in a sea water environment if severe corrosion of the iron was to be avoided. This type of corrosion by two dissimilar metals in contact was to become known as galvanic corrosion, though it is more precisely called bimetallic, or dissimilar metal, corrosion. 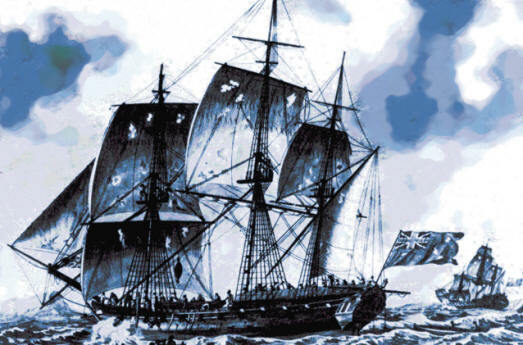 HMS Alarm, the Royal Navy frigate which in 1763 was the subject of the first recorded study of bimetallic corrosion. It would seem that the first occasion in which this advice went unheeded was in 1769 when Commodore the Hon. John Byron began a circumnavigation of the globe in his coppered ship, Dolphin. In addition to the frightening prospect of an uncharted Coral Sea reef scything through the hull, 'Foul-Weather Jack' lost much sleep because of a thump-thump-thump below the stern windows of his cabin. He recorded in his log that he feared that the Dolphin's very loose rudder would drop off at any time for its iron pintles, which were in contact with the copper sheathing, were corroded away to needle thinness. With no prospect of a repair in such a dire event, this was a quite unnecessary worry in addition to the multitude of others with which he had to contend. Since those times, the phenomenon of bimetallic corrosion, in common with the many other forms of corrosion described in this book, has continued to cause service failures, despite its apparently well-publicised effects. In 1962 a report fell upon a plastic desktop in the British Ministry of Defence. This study bore a striking resemblance to its bicentennial antecedent for it revealed that the copper alloy end-plate had fallen off a seawater evaporator on board a submarine because the steel bolts with which it was secured had effectively dissolved through galvanic action. 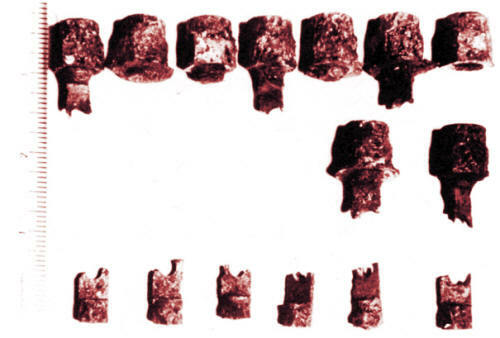 The remains of the bolts are shown in the following figure. The remains of steel bolts which in 1962 had been used to hold a copper alloy end-plate on to an evaporator on board a Royal Navy submarine. In 1982 the nose wheels failed on two Royal Navy Sea Harriers which had returned from the Falklands conflict. Studies showed that the same galvanic action which had been so clear to the scientists who had studied HMS Alarm 219 years earlier had occurred between the magnesium alloy wheel hub and its stainless-steel bearing. These are examples from one industry alone: despite these three cases, the Royal Navy is by no means atypical in its proportion of corrosion failures. Examples abound throughout the engineering world which illustrate quite clearly that, as in all other sections of society, we do not always learn the lessons of past experience. 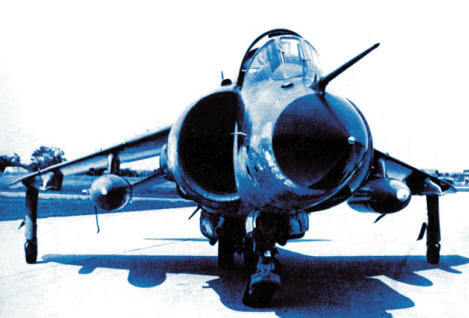 A Royal Navy Sea Harrier which suffered nose wheel collapse because of bimetallic corrosion between the bearing and the wheel.